Former President Bill Clinton will deliver the keynote address at Emory Law's Centennial Gala on Saturday, April 29. Former U.S. Sen. Sam Nunn will receive the school's Lifetime Achievement Award. Emory University School of Law announced today that 42nd President of the United States Bill Clinton will deliver the keynote address at the school’s Centennial Gala. Former United States senator and Emory Law alumnus Sam Nunn will receive a Lifetime Achievement Award at the event, which will take place Saturday, April 29, 2017, at 6:30 p.m. in Atlanta. The gala is the culmination of a weekend of reunion and Centennial-themed events, and the final event in a series of nationwide events celebrating Emory Law’s founding. Other speakers at events in Atlanta and across the country have included NAACP President Cornell Brooks; civil rights leader and member of Congress John Lewis (D-Ga.); Emory faculty members; and the CEOs of Moody’s, GlaxoSmithKline and MetLife. 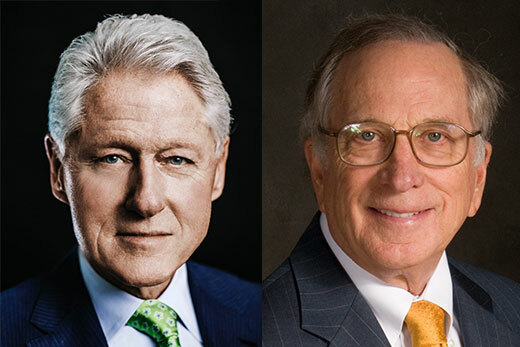 Emory Law, which ranks among the nation’s top 25 law schools, will have hosted two of the five living former presidents of the United States in a single month this year. Former President Jimmy Carter, University Distinguished Professor at Emory, spoke on campus April 6, delivering the law school’s annual David J. Bederman Lecture. The Centennial Gala is a ticketed event and space is limited; Emory Law alumni may purchase tickets here.